All About the Donuts: Donuts in an Empty Field (For the Love of Donuts Book 1) Publication Day June 3rd (Tomorrow)! Have you joined the release party for Donuts in an Empty Field? Go RSVP now. 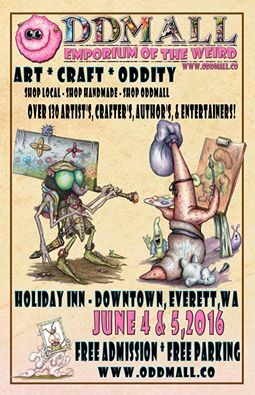 And Oddmall in Everett is coming up this weekend! Be sure to stop by our booth (8) and say hello, maybe take your picture with me. Local young adult writer, Rachel Barnard, will release the first novel in her young adult For the Love of Donuts series titled Donuts in an Empty Field with Life’s a Book Publishing, June 3rd, 2016 (AKA National Donut Day). Pre-order your copy HERE. Congrats on the release. Tweeted.